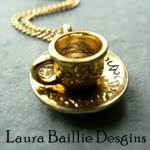 Laura Baillie Designs ..... things: Who is coming to tea? 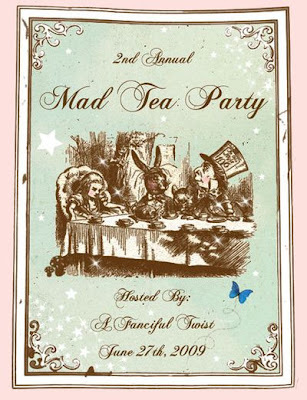 A Fanciful Twist has sent out her invites for this years "Mad Tea Party" on the 27th June 2009. Would you like to join us? I am loving all things Alice at the moment so I will be having a themed party right here on the day. You can join in by visiting her blog and registering and then on the day post up picstures, video or words about your very own tea party. And you get to stop by all the other Mad Hatters' blog who are joining in. The desk clearing is still in progress but already looks so much better and now feels so much more enticing to creative ideas. [I'll post up some before and after pics tommorow!] I am going to finish off today and get started on the shop revamp too. I have some beautiful new creations waiting to be listed. I went to her tea last summer. It was fantastic! In fact, some photos from that party were in an issue of Artful Blogging. I'm sure I'll be there again this year.